On this date in 1944 German U‑boat 852, skippered by 28‑year‑old Heinz-Wilhelm Eck, tor­pe­doed the British-chartered Greek freighter SS Peleus as it steamed west across the Atlantic from Free­town, Sierra Leone, to Buenos Aires, Argen­tina. After the Peleus sank, U‑852 patrolled the large debris field for five hours. Crew mem­bers used hand gre­nades and auto­matic wea­pons to shoot sur­vivors and destroy evi­dence of the Peleus’s demise. Of the 35 men aboard the Greek vessel, including eight British sea­men, three sailors managed to sur­vive. U‑852 con­tinued down the western coast of Africa, sinking the British cargo ship SS Dahomian off Cape Town, South Africa, on April 1 before sailing north. A month later, on May 2, Eck himself sur­vived the loss of his sub­marine when six British bombers forced it onto a reef off the East African Somali coast. After the war, Eck was tried, con­victed, and con­demned to death, along with his engi­neering offi­cer and the ship’s doc­tor, by a British mili­tary court in Hamburg for ordering his crew to shoot the sur­vivors of the Greek steamer. (The Hague Con­ven­tion of 1907 banned the killing of ship­wreck sur­vi­vors under any circum­stances.) The three Germans were the only sub­mariners executed for war crimes committed during World War II. 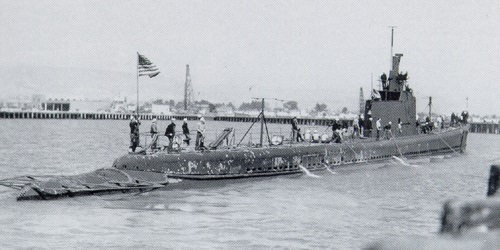 Above: USS Wahoo, sunk October 11, 1943, by Japanese ships and aircraft in the strait that separates the Russian island of Sakhalin and the Japanese island of Hokkaidō. 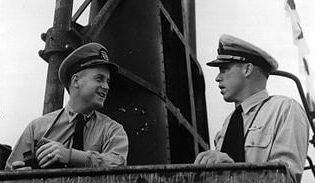 Left: Skipper Dudley “Mush” Morton (right in photo) speaks with his exe­cu­tive officer, Richard O’Kane, on the bridge of the Wahoo days after sinking the Japa­nese troop trans­port Buyo Maru on Janu­ary 26, 1943. During his four patrols com­manding the Wahoo, Morton became one of the most-cele­brated sub­mariners of World War II, sinking at least 19 Japa­nese cargo and trans­port ships for a com­bined total of 55,000 tons, more than any other commander of the time. Right: The newly fitted hospital ship AHS Manunda in Darling Harbor, Sydney, Australia, August 1940. 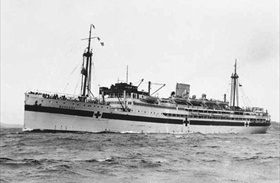 The Manunda made four trips to the Middle East and the Mediterranean between November 1940 and September 1941. The hospital ship was one of 55 ships caught in the harbor during two Japa­nese air raids on Darwin, Northern Terri­tory, on Febru­ary 19, 1942. Despite her highly prominent red cross markings, the ship was damaged by a near miss, then a direct hit. Eleven members of the ship’s crew and hospital staff were killed, nineteen others were seriously wounded, and another forty or so received minor wounds. The hospi­tal ship was able to deliver its wounded and other Darwin casual­ties to Free­mantle, the port of Perth, Western Aus­tra­lia, eight days later. During the war she carried roughly 30,000 casualties to safety.